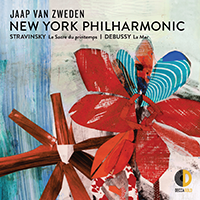 Whether or not you join us Thursday night for New York, Meet Jaap, look up: for yet another year, the Empire State Building will glow Philharmonic red, this time shining all the brighter in celebration of Music Director Jaap van Zweden’s inaugural season. Wednesday marked many milestones: the launch of the New York Philharmonic’s 175th anniversary season, Music Director Alan Gilbert’s farewell season, and The New World Initiative — the Philharmonic’s season-long, city-wide project revolving around Dvořák’s New World Symphony and its theme of “home” — plus the Orchestra’s first-ever live concert broadcast on Facebook. The day began with a free dress rehearsal open to the 70+ ensembles performing the New World Symphony across the city as part of The New World Initiative. That night, Mozart in the Jungle cast members Bernadette Peters and Lola Kirke, Josh Groban, Ben Vereen, Hamilton producer Jeffrey Seller, Bill Moyers, Itzhak Perlman, and more were among the friends and supporters who gathered for the Opening Gala cocktail reception, glamorous dinner, and the concert itself — featuring Alan Gilbert leading works tied to the Philharmonic’s rich history of premieres by John Corigliano, Gershwin with Aaron Diehl as soloist, and Dvořák. The Empire State Building shone Philharmonic red in celebration. Whether you join us tonight for our 175th Anniversary Opening Gala Concert, look up: for yet another year, the Empire State Building will glow Philharmonic Red in honor of our 175th season, which, appropriately enough, celebrates our hometown. Last night not only marked the New York Philharmonic’s 174th season opening — it also unveiled David Geffen Hall, the new name of the Orchestra’s Lincoln Center home; marked the inaugural appearance of Frank Huang as Philharmonic Concertmaster; and celebrated a historic gift from Philharmonic Chairman Oscar S. Schafer and his wife, Didi. Oprah Winfrey, Steve Martin, Barbara Walters, Woody Allen, George Lucas, Patricia Clarkson, Diane Sawyer, and Alec Baldwin were among the friends and supporters who gathered for the unveiling ceremony plus the Opening Gala cocktail reception, glamorous dinner, and the concert itself — featuring Music Director Alan Gilbert leading the Orchestra in Beethoven and Grieg with pianist Lang Lang as soloist. The Empire State Building shone Philharmonic red in celebration of the new season. Relive the star-studded night!